In stock 15V 3.5A external 52.5 watt regulated power supply, with 15 volt, 3.5 amp DC output from PowerStream, double insulated. This is a compact, high quality, double insulated switchmode regulated power supply, 15V, 3.5A 52.5 watts continuous. It has a 2 prong IEC C8 input connector. The unit comes with the power cord as priced. a variety of slip-on semi-permanent connectors are available below. 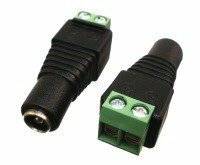 AC plug Removable C7 IEC connector makes it easy to use international mains cords.